Maintaining a structured approach to weekly meetings in an early stage startup can be tough, but it’s one of the best ways to get your team on the same page and moving in the right direction. After trying various combinations of tools and methods at Mindiply, we’ve recently started a new approach to running our weekly meetings. 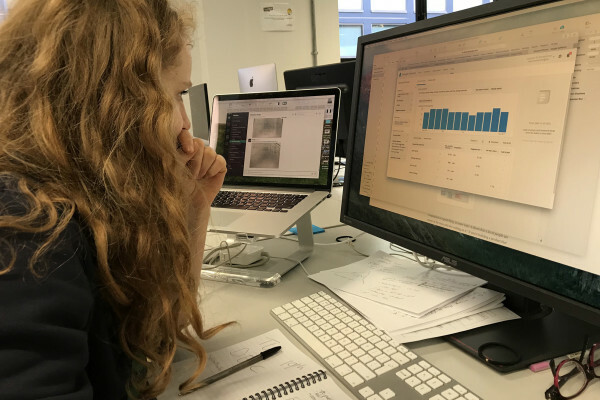 We run a single meeting every Monday morning using I Am Why, the visual strategy planning tool we’ve built to help small businesses and startups. In just a few minutes we can review what we’ve accomplished the week before, and decide what’s most critical to do for the week ahead. In our approach, we endorse the Board Triangle model created by True Ventures founding partner Jon Callaghan. According to this model, for an effective board meeting, you should cover all the three corners of the Board Triangle: Reporting, Strategy, and Leadership. 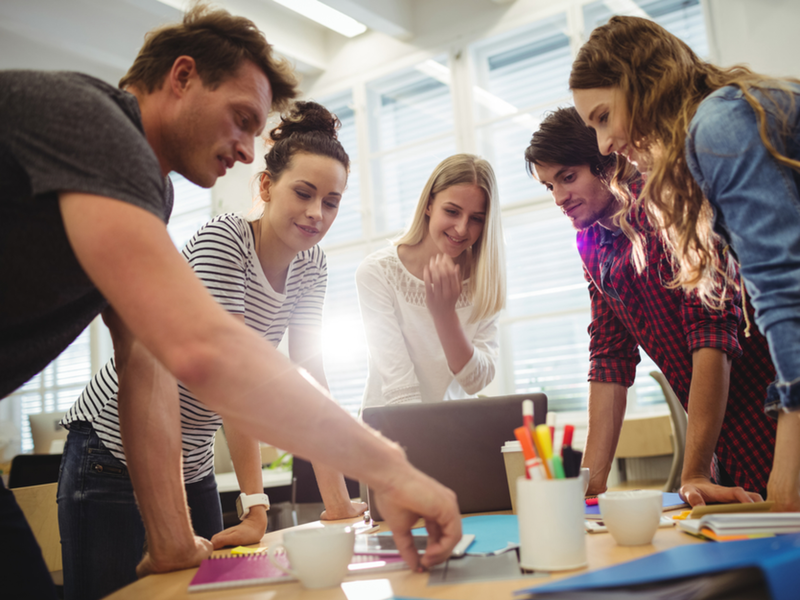 In the next three steps, I’ll show you how to run fast and effective weekly meetings using I Am Why, the strategy mapping tool. I’ll use a fictional startup called Dogsittr, which is building an app for finding a dog-sitter on the fly, and it’s in the phase of validating its problem/solution fit. Before rushing in and deciding what to do this week, it’s wise to stop for a moment and evaluate what’s happened. Do you think you are on the right track and it’s worth going forward with this plan? Or is it time to pivot, iterate or adjust your strategy? Gather your team together and open I Am Why. You’ll see the overall view of your strategic plan (see the picture below), with the current week highlighted. First, you want to review the past week’s objectives, so click on the ‘left’ arrow near the calendar bar on the top to make the past week appear. Let’s now check the last week’s objectives. Click on the bar for the previous week ‘Create paper design’ to open it, and you’ll see the three tasks scheduled: ‘Agreed persona and problem statement’, ‘3-panels paper solution’, and ‘full interaction paper solution’. You have completed the first two, so check them. You haven’t been able to finish the last one, so leave it unchecked for now. It’s important to look at the higher levels, so you don’t miss the big picture and you’re working towards your high-level goals. 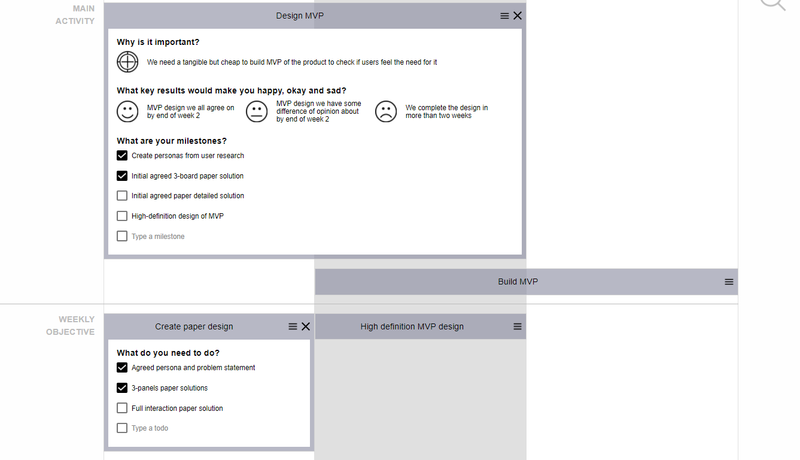 Your current high-level goal is to build the MVP (Minimum Viable Product) and test the value proposition. Did your weekly objectives last week get you closer to the goal? This goal will last for many weeks and is broken down into two main activities, so it’s worth checking those are still relevant and on-track. If you’ve reached any milestones, check them off. 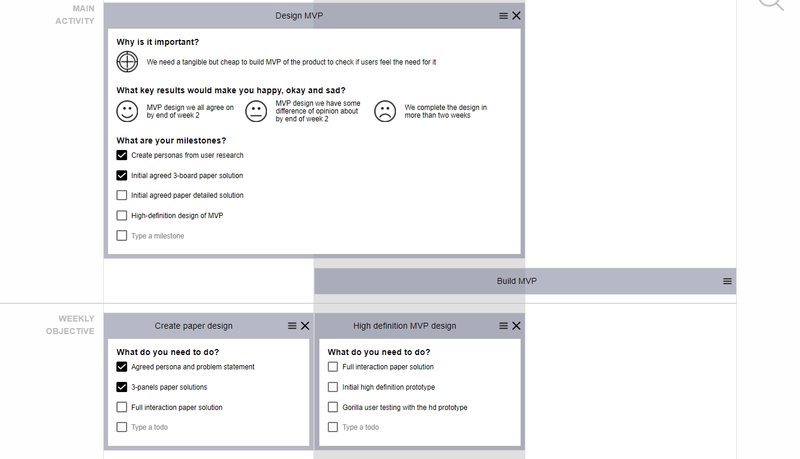 For example, right now Dogsittr has done the first two ones, ‘Create personas from user research’ and ‘Initial agreed 3-board paper solution’, hooray! This view makes you see how the small steps you make each week contribute to the completion of the big plan. You’ve just finished the reviewing progress part of the meeting, and also fulfilled the ‘reporting’ corner of the board triangle, amazing! So, now that you’ve had a look, are you happy to go forward with your plan? Or is it time to pivot, iterate or adjust your strategy? If you agree that you can safely proceed forward, it’s time to decide what to do next. Open the bar with the current’s week objectives and then start by adding the objectives that were not completed during the previous week, if they’re still relevant. 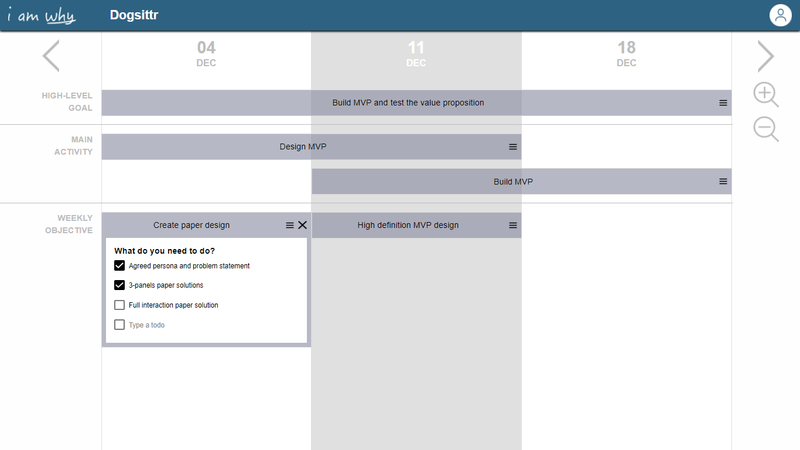 Then add any objectives related to this week’s main activities, ‘Design MVP’ and ‘Build MVP’. 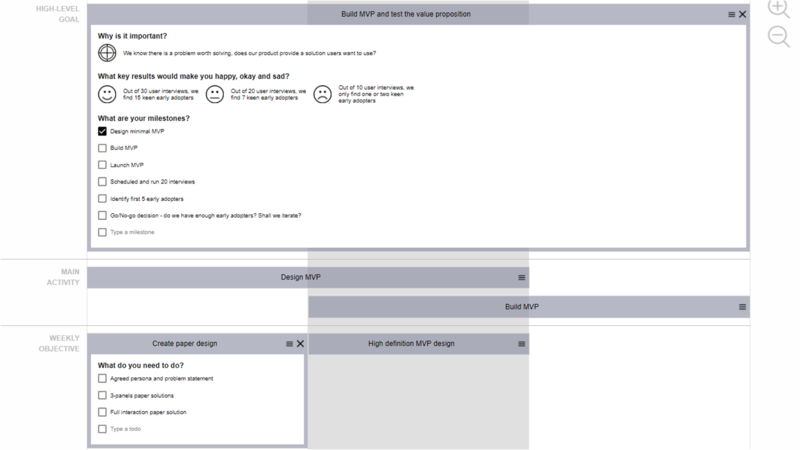 TIP: in this tutorial we are using the demo template built using I Am Why, so the bar already exists. When you’ll start your strategy from scratch, just click to create a new bar and give it a name. Well done, the planning phase is completed, and you can mark as done the ‘strategy’ corner of the board triangle! TIP: if you are working on a smaller screen, or very zoomed out, some bar will open as pop-ups instead of in the main window, to avoid readability problems. You can still make them appear on the main screen, side by side, as in the picture above, by zooming in a little, using the zoom in icon on the right of the screen. If you don’t have other stuff to communicate to your team, then the weekly meeting it’s done, so go back to work! The updated plan is shared with all your team now, so they all will be one the same page and know what really matters for the week ahead. And they’ll have access to the higher levels of strategy too, so they can always see and understand why something is relevant now. Where is the ‘leadership’ corner of the board triangle? It’s almost anywhere: you need someone to introduce the method and guide the team meeting, but moreover a leader is needed when things are not so clear or there are some not so pleasant decisions to take, such as whether it is time for a drastic pivot and to throw away most of what you’ve done in the last few weeks or months. We are using this method for a while now, and we really love it. 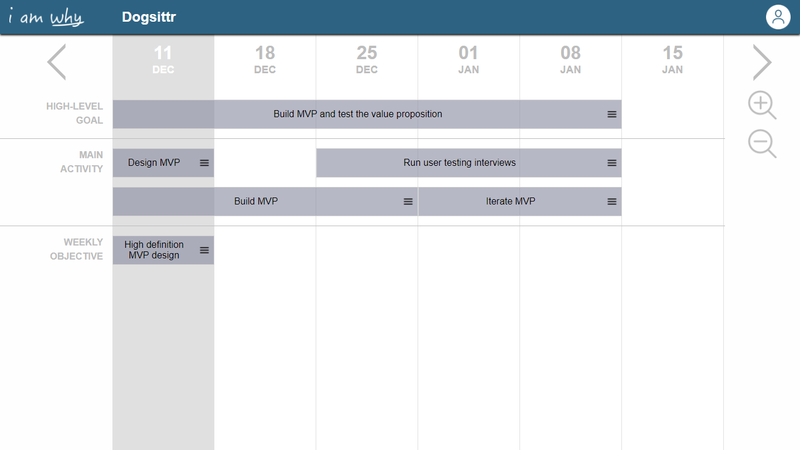 Quick and painless, without the thrills and frills but straight to the point: track what we have accomplished so far and decide what is important to do next, without any waste of time. You can try it right now in I Am Why, a simple but effective strategy mapping app built by a startup for startups and small teams. And it’s free, try it now here! What have you learnt in the past year about creating a successful strategy for your startup?